Today, cruise lines are adding new, high-quality entertainment and dining options. While every cruise line has their differences, so does every ship within a cruise line. 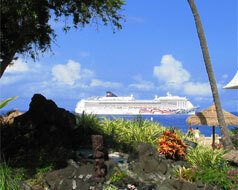 Cruise lines have non-stop action providing entertainment both day and night for all ages. Listing every single dining, activity, and entertainment available for each ship would take pages and pages! So, find a sampling below for what you can do on Norwegian Cruise Line, Princess Cruise Line, Royal Caribbean Cruise Line, and Disney Cruise Line! Dining – Texas Smokehouse, Ocean Blue (seafood), Coco’s (chocolate), La Cucina (Tuscan), Cagney’s Steakhouse, Los Lobos (Mexican food), Teppanyaki, Le Bistro (French cuisine), Star Bucks, Dolce Gelato, Garden Café, O’Sheehan’s Neighborhood Bar & Grill, and multiple dining rooms. Activities – Aqua park, 678 Ocean Place (3 decks of nonstop fun), Sports Complex (ropes course), Free Fall and the Whip (5 multi-story waterslides), Walk the Plank, mini-golf, go-cart race track, laser tag, observation lounges, spa & salon, dancing, casino, and a teens retreat. Entertainment – Beatles music club, Broadway shows such as Rock of Ages, Burn the Floor (Ballroom dancing Broadway performance), Cirque Dreams (acrobats/aerialists/musicians dining experience performance), Howl at the Moon – Rock ‘n’ Roll Dueling Piano Show, Wine Lovers The Musical, Escape the Big Top, Levity Entertainment Group, and The Supper Club (dining and theater), musicals, and a comedy club. Princess Cruises focus on providing eye-opening cultural encounters and dining experiences. Dining – Chef’s Table Lumiere, Sabatini’s, Crown Grill, Crab Shack, Vines, Harmony, Ultimate Balcony Dining, and La Mer, A French Bistro by Emmanuel Renaut. Activities – Discovery at SEA Programs, Festivals of the World, The Seawalk, Art Gallery & Auctions, Princess Live! (live concerts, comedy & game shows, culinary shows and more), The Atrium, Hollywood Pool Club, Club 6 (dance club), sports court, karaoke, pools and hot tubs, mini-golf, and game lounges. Entertainment – Movies Under the Stars, The Voice of the Ocean, Watercolor Fantasy Show, Broadway worthy shows, musical productions, dancing, casino, and guest entertainers. Royal Caribbean has the perfect mixture of activities and entertainment for adults and children. Dining – Wonderland, Coastal Kitchen, Solarium Bistro, Chops Grille, Jamie’s Italian, Chef’s Table, Izumi Japanese Cuisine, Sorrento’s, Windjammer Marketplace, Seaplex Doghouse, The Café @Two70, Café Promenade, and Johnny Rockets. Activities – Flowrider, IFLY (skydiving inside), bumper cars, rock climbing, spa, pools, running track, gym, scrapbooking, arcade games, salsa dancing, pool parties, game shows, scuba certification, dance classes, and a zipline. Entertainment – Two70 (panoramic views and shows), We Will Rock You, The Gift (musical), Broadway performances such as Grease and Mamma Mia, Aquatheater shows, live band and dancing, piano sing-alongs, ice-skating shows, live orchestra performances, and more. You know that when Disney is going to entertain, it’s going to be phenomenal! Dining – Pinocchio’s Pizzeria, Royal Court Royal Tea, Animator’s Palate, Palo, Cabanas, Flo’s Café, Eye Scream Treats, Frozone Treats, Enchanted Garden, and more! Activities – AquaDuck/AquaDunk (water slide), Disney movies and live performances, Wide World of Sports (a deck just for basketball, ping-pong, soccer, etc. ), Pirate Night, Bibbidi Bobbidi Boutique (salon for young, preschool aged children to get their hair and makeup done), Royal Court Royal Tea (Character Dining Experience), Sail-Away Celebration, Quiet cove pool (adult’s only pool), Star Wars Day at Sea, Pixar Pals Party (Alaskan cruises only), adult spa and salon, beverage tastings, youth clubs plus a nursery for preschoolers, sports and fitness facility, live shows and entertainment, swimming pools for children and the whole family and more! Entertainment – Tangled: The Musical, Frozen Deck Party, Disney Dreams – An Enchanted Classic, Twice Charmed: An Original Twist on the Cinderella Story, Disney movies, night clubs and lounges for games, and other musical productions.